This salad tolerate many improvisations, you can include other products. French salad in layers necessary ingredients. Potatoes – 1 kg or 5 medium potatoes, eggs – 5, mayonnaise – 200 grams of yogurt – 400 g (big package), cheese – 100 grams. Boil the potatoes and then peel them as cool. Boil eggs and peel them. Mix the mayonnaise with yoghurt and season to taste them. In suitable deep bowl grate layer of potatoes, cover with mayonnaise sauce, grate cheese on top put eggs and finish with sauce. Alternate until finished products as complete with sauce, grated cheese and boiled eggs. 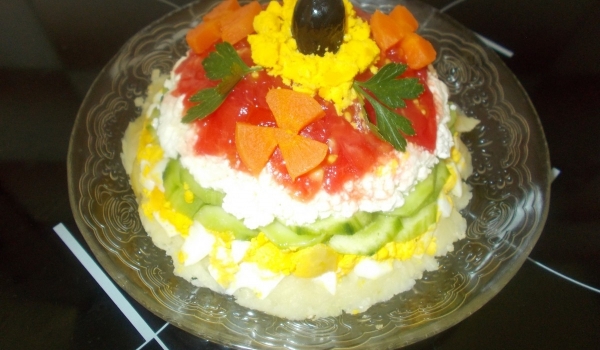 You can arrange this salad in layers using a ring cake. The salad is extremely light despite the products it contains. Enjoy your meal! Cucumbers – 1. tomatoes – 2. egg – 1 pc. boiled potatoes – 3. cooked cheese – ’50 crumbled, olives – for decoration, parsley, salt, pepper, colorful salt, carrots – to decorate, oil, vinegar. Potato and egg wash and boil in salted water. Peel the potatoes and grated sprinkled with colorful little salt. The egg is peeled, chopped a little yolk for decoration, the rest is cut into small pieces. Wash and peel vegetables. Cut the tomatoes into small pieces without seeds and lightly sprinkle with a little salt, cucumber cut into thin crescents. In a bowl or pot lined with transparencies, the edges are suspended freely pour chopped tomatoes and pressed with the back of spoon. Top ranks crumbled cheese, followed by cucumbers, finely chopped egg and ends with grated potatoes. Pressed well, all fold inward and leave in refrigerator for 20-30 minutes. Then remove and invert pan, the foil is removed. 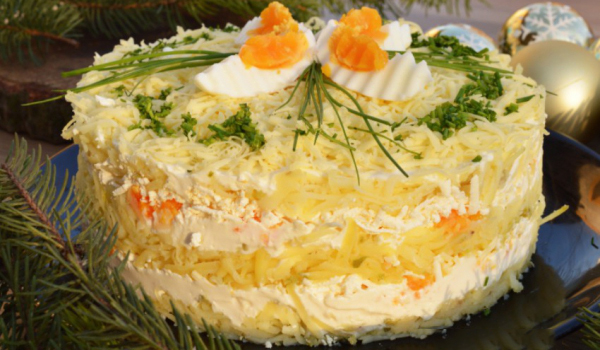 On top is decorated with leaves yolk, olives, carrot flowers and leaves of fresh parsley. Gulf with oil and vinegar and serve. Tasty and spectacular! This salad tolerate many improvisations, you can include other products.